Here is how to get your shipping quote before your buy! Select the qty of items you would like to buy and click Add to Cart. On the next page select "view or edit your cart". In some cases international shipping estimates come back higher than expected. If your shipping quote does not look accurate please let us know and we will quickly be able to determine if we can ship at a lower price for you. Click HERE to message us through our contact form. Please provide us with the item quantity & your shipping address. We will respond quickly with the best shipping price we can offer. The Zip Grip Go is a brilliantly designed, easy to use, alternative traction device for snow and mud. They fit all rims up to 22" on cars, vans, SUV & trucks. 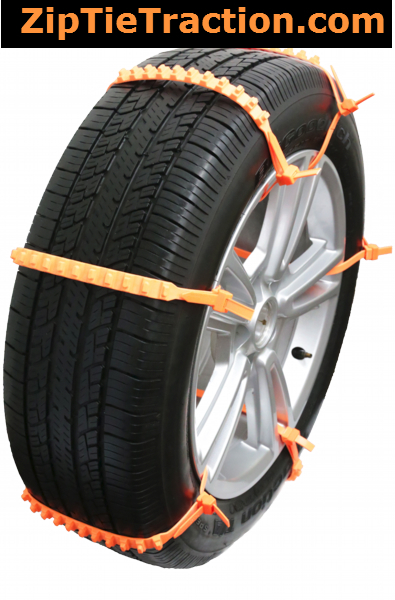 They are a must have for winter driving and everyone should have a set in their winter emergency kit. 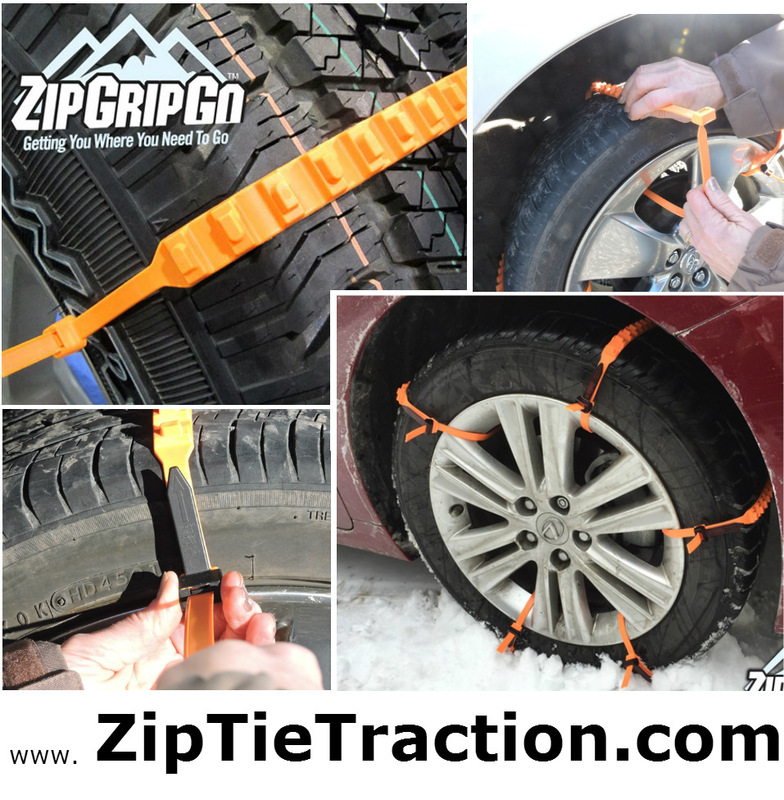 Buy a package or two of our Zip Grip Go cleated tire traction aids and you will not have the need for heavy metal snow chains anymore! 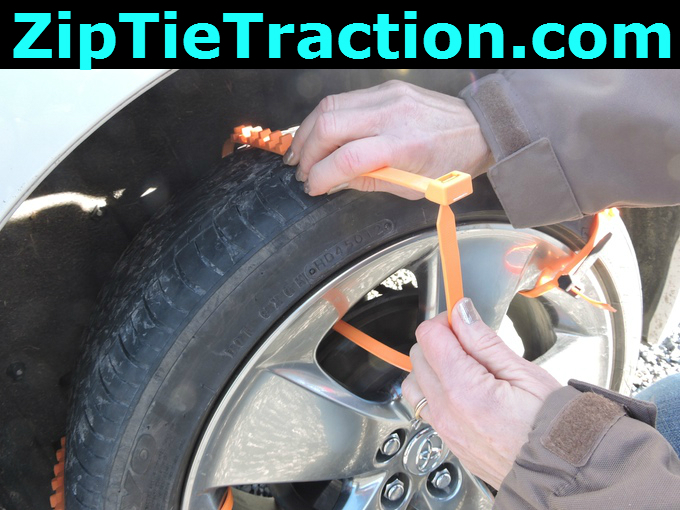 Fits rims up to 22"
ZipGripGo...the easy to use emergency traction device!.. Watch The Zip Grip Go video to see them in action! How durable is Zip Grip Go? In one word - Extremely! After 3 years of extensive research and development, This one of a kind tire traction device has been perfected. Made from specially engineered grade material that is so durable it performs beyond expectations. Works great in SNOW, ICE and MUD. Works in both warm and cold climates. How long does it take to install Zip Grip Go? Thanks to its unique patented design, Zip Grip Go is extremely durable and lightweight. on average it takes less than 5 minutes to install. I is can also be easily installed on tires even after you get stuck! Can Zip Grip Go be used in forward or reverse direction? Absolutely! It has a special double tiered design allowing both forward and backward mobility. How many Zip Grip Go's should you install per tire? There is no exact number to install. It truly depends on your rims and how stuck your vehicle is, or how much snow or mud you would like to drive through. Some rims accept 5 and others 6. There are 10 in each pack! What size tires will Zip Grip Go’s fit on? Zip Grip Go was designed to fit on most cars, SUV’s and trucks. The adjustable feature on Zip Grip Go will fit on rims up to 22”. Our goal was to develop a product that can easily allow you to use your own vehicles power to get you unstuck and back on your way. This not only avoids the need for costly towing service, but it gets you and your passengers out of harm's way without having to wait for help in a dangerous spot. We tested the product for years and found that after getting unstuck, our test market preferred a quicker method of removal for safety reason versus re usability and for that reason they recommended for a onetime use. Order online above or call 877-224-4899. We are available 7 days a week!